In 1549 Eleanor of Toledo, wife of Duke Cosimo I Medici and daughter of Emperor Charles V, bought the unfinished palace of the Pitti family and in 1550 the palace became the official residence of the Duke of Florence (Grand Duke after 1569) until 1860 and from 1865 to 1870 the residence of the King of Italy. 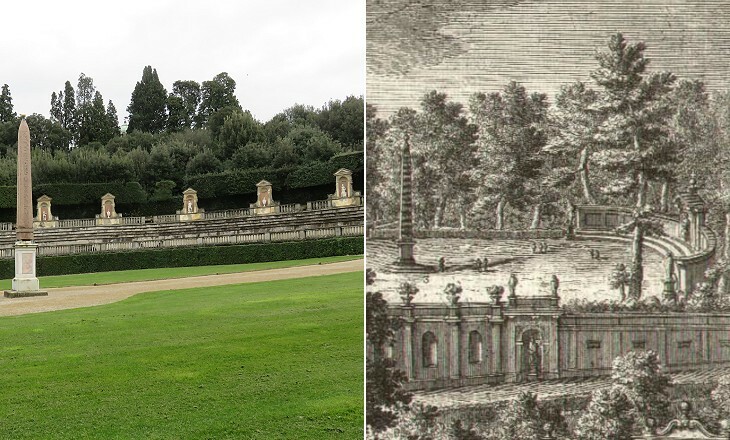 Eleanor and Cosimo asked Niccolò Tribolo to design a garden on the slopes of the Boboli hill behind the palace. The garden designed by Tribolo was the object of many additions and changes in the next two centuries. It has several points of contact with the gardens of the Roman villas. Near the entrance Bernardo Buontalenti designed a grotto (an artificial cave) aimed at providing a spot where the Duke and his family could find a cool place during the Florentine hot summers. 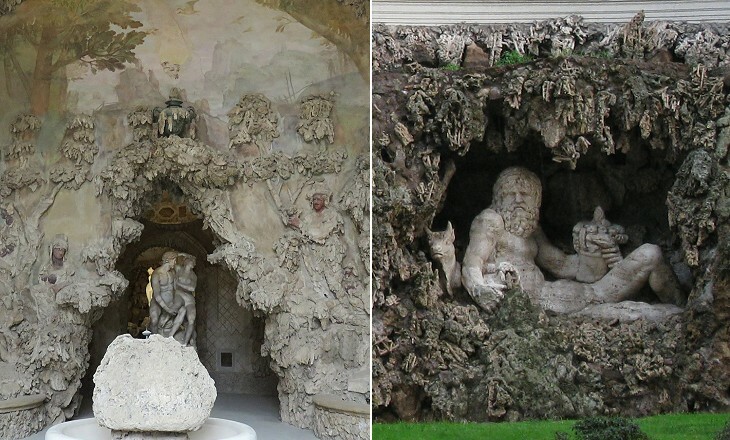 The idea was not original as the ancient Romans had already embellished their villas with similar grottoes (Ninfeo di Egeria, Grotte di Nerone), but Buontalenti designed a rich decoration imitating the rocks of a cave which influenced the design of similar grottoes in Rome. Amaltheia, the mythological she-goat nymph who fed Zeus, apparently was very popular in the second half of the XVIth century and she appears in the decoration of both Boboli and Casino Pontificio in Vaticano. When Zeus became Lord of the Universe, he set Amaltheia's image among the stars, as Capricorn. The Grand Dukes moved to Boboli several statues which decorated Villa Medici in Rome. Two ancient Roman statues portraying a Dacian prisoner greet the visitors at the beginning of the alley leading to the top of the hill. After the conquest of Dacia by Emperor Trajan, the Dacian prisoner became a recurring theme in the decoration of Roman monuments and buildings. The prisoner was always portrayed in a very dignified manner as his proud standing increased the glory of the emperor who had subjugated him. The main treasure the Grand Dukes moved to Boboli from Villa Medici is the Egyptian obelisk which once stood in Isaeum/Serapeum Campense a large complex of Temples dedicated to the Egyptian gods Isis (hence Isaeum) and Serapis (hence Serapeum) in Campus Martius (see a page on the obelisks of Rome). 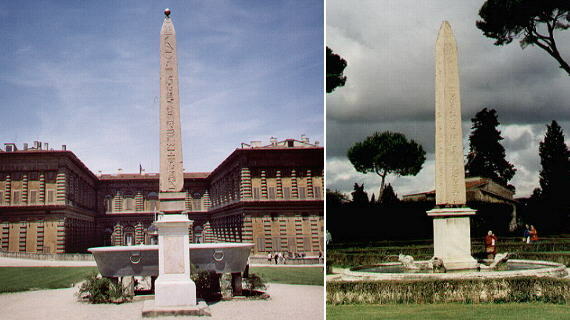 The obelisk was originally erected by Ramses II in Heliopolis. A copy now stands in Villa Medici. The obelisk was placed at the centre of an existing amphitheatre and it replaced a large group of statues by Giambologna which were moved to embellish a large fountain in another point of the garden. By placing the obelisk at the centre of the amphitheatre the Grand Dukes imitated the example of Villa Mattei in Rome. 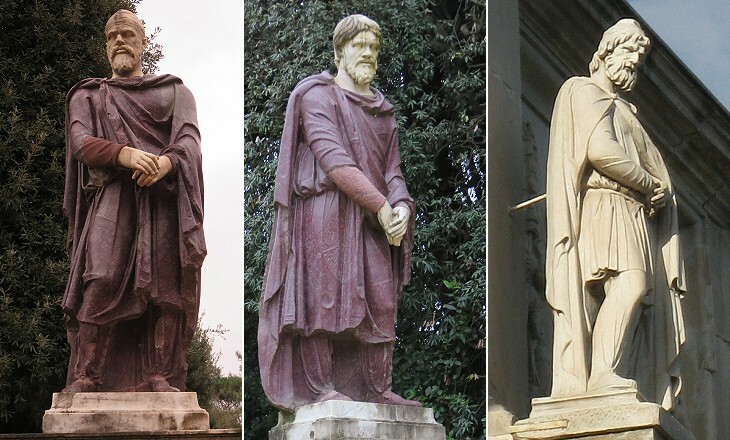 The Grand Dukes placed in Boboli many ancient statues which in some cases were largely restored (left): they also placed some late Renaissance statues having the appearance of an ancient statue (centre) with only a few statues dedicated to contemporary subjects (right). The seller of water is also one of the talking statues of Rome. The fountains in Boboli have several points in common with Roman fountains in the choice of subjects (tritons) in the use of small bronze additions, in providing the scene for mythological events (Andromeda chained to a rock, crying for help while the sea-monster sent by Poseidon emerges from the water) and in surprising the viewer with unexpected details. At the moment of leaving Boboli through Annalena's gate my attention was caught by the lion at its top: it was a true lion not one of the very humanized Renaissance and Baroque lions. It was most likely sculptured by someone who had seen the lions by Antonio Canova in the Monument to Clemens XIII. Return to page one or climb the hill and see a Fortress With a View.